SFI Omidyar Fellow Andrew Berdahl and his colleagues need help mapping wildebeest migration. Can you spare a few minutes to be a citizen complexity scientist and interpret their movements in images from an array of camera traps in the Serengeti? Berdahl's research focuses on collective intelligence in animals groups and in what situations a group, as a whole, acts as a large sensory array and a distributed computer. Using sophisticated data, such as an individual's trajectory within a group, he aims to develop more causal and predictive theories of complex animal swarms than currently exist. In this project, the researchers want to identify which direction one or more wildebeests are travelling in each camera shot so they can map their migration movements at finer scales, and relate them to important "resource gradients" such as vegetation and rainfall. 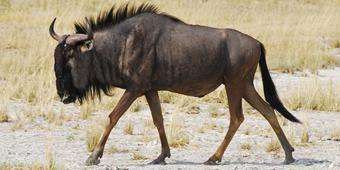 Past research suggests that a herd of wildebeests (not known for their individual intelligence) might be like a colony of ants – greater than the sum of its parts. By traveling together in large herds, wildebeest might be improving their situation by climbing these resource gradients, essentially boosting their limited individual brain-power with a collective intelligence that arises from the group. The movement data from the camera traps will be merged with satellite imagery of grass growth and lightning strikes to test these hypotheses. But to do this, the researchers first need to know "Which direction are the wildebeests moving in this photo?" There are hundreds of thousands of images to be interpreted. The researchers need help from an army of citizen (complexity) scientists. That's where you come in. To help build the dataset, simply use your innate human interpretation skills to watch a series of photos from a Serengeti camera trap. Click the play button at the bottom of the frame, follow the prompts, and submit your interpretation of their movement. You can also help the researchers by interpreting images of sun position and shadows. Interpret as few or as many images as you like. Every bit helps. "It is pretty fun to do," says Berdahl, "so please give it a try and pass the link on too! Good luck and thanks so much."